The Noxcrew: a collective of creativity and fun. Over the years, the crew has sent more than 24 contestants through their games and challenges. Some lost, some won. Some won more than others. Lets change things up a bit. What is the Noxsquad Gameshow? Everyone is invited to watch the rivalry unfold, and this time, to join in! The RASA Studios Twitch Channel and The RASA Studios Teamspeak Server (IP will be announced closer to the show)! 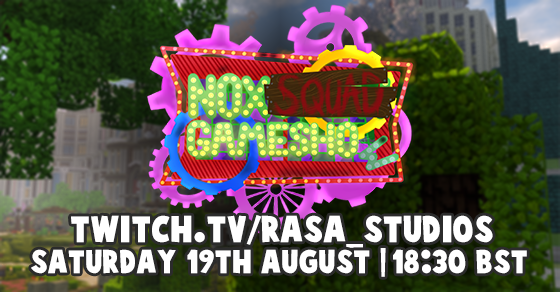 Based on the hit YouTube series 'The Noxcrew Gameshow' and built on the RASA Studios build server, The Noxsquad Gameshow is built by the community for the community. In a dark run down factory, a secret sect of the community plots deep into the night. Kidnapping three prominent members of the Noxcrew and another three from the Twitch chat in a move to be reported online as "Almost routine by now" and "Beginning to get repetitive", they will battle in 3v3 combat throughout a combination of spinoffs and brand-new, original games! No, please don't do it. Please, I actually legit beg you. After over nine months since our last show, and half a year of blood, sweat and tears, RASA Studios is back to bring you a brand new show! This time around, we've used a team of 30 builders, thousands of blocks, 4 cameras, 3 spirit guides, 2 commentators, 1 host, 2 scanning bays, 21 cars, 4312 chickens, half a cyborg, 34 gravestones, 340 clones, 1 Bushter, 8 games, 8 piangles, 3 editors, dozens of trees, no scripts, no train models, too many hours of artwork, 1 glitchy N.O.B., 73 OakleyB shrines, too many magic squares, 3 french hens, 2 turtle doves and a Referee in a pear tree. We've really put a lot of work into it, and we're sure that you'll enjoy it! It's more than just a fourth episode, it's a re-invention of what it means to be a gameshow. You can join in as well! First of all, make sure that you have Teamspeak 3 installed - you'll need it to play! Then, join our temporary Discord server where we'll be selecting contestants from. Be sure to brush up on your trivia knowledge! Disclaimer: Any individual who has worked on the Noxsquad Gameshow and/or any games featuring in this episode will not be eligible to play on the Yellow Team in this episode. RASA Studios reserves the right to make such a judgement on the night.